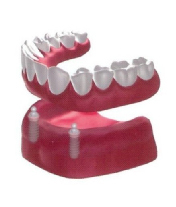 Aesthetic Dental Implant Centre - Dental Implants > What can Dental Implants do? Some patients may have lost only a single tooth. This may be at the back of the mouth or at the front of the mouth in the “Aesthetic Zone” – the area of the mouth that we show most when we talk or smile. A single dental implant and crown can replace these teeth without the need to cut into adjacent healthy teeth to prepare conventional crowns or bridges. Dental implants also have the advantages of bone maintenance not shared by conventional techniques. When a number of teeth are missing then dental implants can correct this. 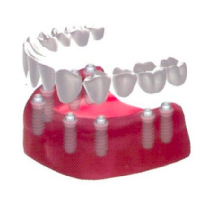 A number of implants are placed and these are linked together by means of a dental bridge. 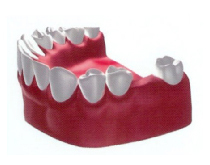 Depending on the number of teeth missing not all the teeth need to be replaced with implants and this produces a fixed permanent solution to larger gaps in the dental arch. Some patients may have lost all or nearly all of their natural teeth. In this situation there are two main options. 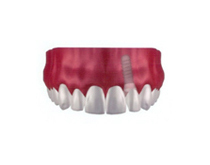 Firstly the missing teeth can be replaced by a number of dental implants and a fixed bridge. This provides a fixed replacement for the lost natural teeth and allows the same level of function as the lost natural dentition. 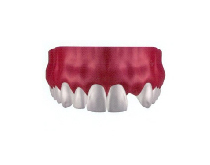 The second option is to provide a special style denture (Overdenture) which locks onto the implants but is removable by the patient. 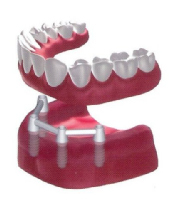 In some patients this is a very effective solution and although it has some disadvantages to the fixed replacement by bridges this can be very satisfactory in selected cases. As its name suggest this involves placing the implant in a tooth socket at the same time as the natural tooth is removed. This has some obvious appeal but not all patients are suitable for this technique. 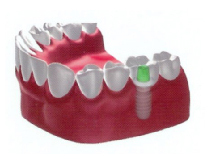 The implant is either placed immediately and then a normal period of healing is allowed before a crown is placed (Immediate Replacement) or a crown can be placed on the same day (Immediate Replacement and Immediate Loading). Both have slightly different requirements and again not all patients are suitable. 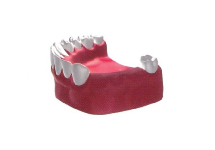 Some patients receiving orthodontics need to use devices called headgear to prevent movement of teeth in directions opposite to that needed to correct their bite. These headgears provide additional anchorage for the braces to work against. The headgear can be considered uncomfortable and needs a big commitment by patients to allow treatment to be successful. Dental implants can provide an alternative to this by placing implants at the back of the mouth or palate. This tends to make treatment quicker, is less cumbersome and increases patient compliance and hence orthodontic success.